In today's internet-based, super-social, platform-driven society, it can be tough to know where to begin. So small business owners and bloggers - listen up, because today's post is specifically for you! To be successful in business or in blogging, you need to have great systems in place. And the key to a great system is a great tool. Enter CoSchedule*! Before I started using CoSchedule, I had a system written down in my Evernote of exactly what to do each time I posted a blog. This included not just posting my blog, but scheduling out my posts to share on Twitter, Facebook, Instagram, Pinterest, and Google + (and that's without factoring in LinkedIn, Periscope, YouTube, SnapChat, and any others). (1) I can schedule almost everything from one place. CoSchedule is an all-in-one marketing calendar that brings my content and social media in the same place. 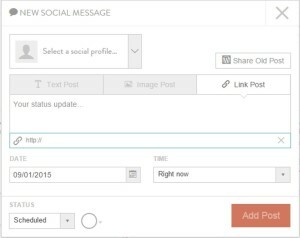 I use the WordPress plugin to load all of my social media posts. And CoSchedule integrates easily with WordPress, Evernote, Google Docs, Google Analytics and links to Facebook Public Pages, Facebook Personal Pages, Facebook Groups, Twitter, LinkedIn, Buffer, and Google +. So as soon as I've finished a post, I go straight into CoSchedule and populate my social schedule. And I can easily reschedule old blog content with the click of a button. (2) I can drag-and-drop items within my calendar. This level of simplicity beats all of the competition hands-down. If I change my mind about what I want to post today, I can simply drag the post from one section in the calendar to the next. Other platforms are much more complicated when it comes to changing the date or time of a post. (3) I have metrics and reporting that show me exactly what is resonating with my niche market. Before CoSchedule, to figure out what was working I was having to manually review information from multiple sources. But with one click in CoSchedule I can immediately see which posts are the most shared within my target market. If you've been struggling to find a Social Media tool that meets your needs, I highly recommend heading over to CoSchedule*and starting your 14-day free trial asap (no credit card required)! Do you have a system you use for managing your social media? Have you plugged into CoSchedule* yet? What's your favorite use for this amazing platform?